As a Chicago-based company, it’s always a treat when pieces come to us with a bit of local art history. 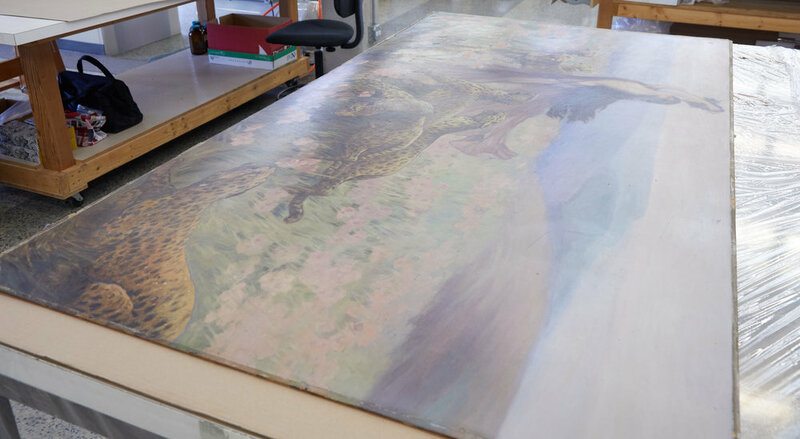 Recently, we had the opportunity to restore a large painting by James Allen St. John, a Chicago artist who is most commonly known for his illustrations of the popular Edgar Rice Burroughs "Tarzan" series. St. John was born in Chicago in 1872 and was first introduced to the art world by his mother, who was also an artist. After traveling to study at the Art Students League in New York and the Académie Julian in Paris, St. John returned to his home town and began working with the publishing company A.C. McClurg, where he met fiction writer Edgar Rice Burrows. St. John would illustrate covers and chapter-heads for Burrows's "Legends of Tarzan" for many years, while also earning commissions for other book illustrations along the way. Though he also dabbled in portraiture and other genres of painting, St. John excelled with his narrative compositions that depicted fantasy scenes – one of which recently came to The Center in need of care. The painting is St. John’s “Bacchanale”, signed and dated from 1923. It depicts a woman wearing a sheer purple dress surrounded by leopards in a field of flowers. The painting came to The Center framed, and after taking photographs of the work upon its arrival, the large piece was unframed in preparation for formal examination by our Painting Department. Right away, our conservators noted that the painting was executed on an illustration board that was extremely brittle and desiccated, and very prone to crack as a result of any movement. When our conservators removed the frame, they observed that a small linear crack had formed along the bottom of the piece. Additionally, the board was warped significantly in a convex manner. Due to the warp, the framing edges that should have been behind the frame rabbet were exposed on the paint surface. The layers of the composition board were delaminating from themselves, and there was a large white stiffer board insert in the back at the upper left corner that appeared to be an old repair to the board. The board had been primed with a white ground, and the painting was executed in a medium characteristic of oil that was thinly to moderately applied. The piece was signed in the lower left corner in black oil paint, and there were cracks in the paint layer that corresponded to the old board repair on the back. There was a 4” diagonal crack in the upper right corner that had been overpainted and was slightly mismatched, and to the left of this diagonal crack there was a 2” round repair that was also overpainted. There was a heavy band of repaint that covered the darker blue horizon; this extended both to the right and left of the figure. As this painting was in the artist’s studio until his death and then owned solely by the family of our current client, our conservators presumed this repaint was done while the artist still had the painting in his care. There was a light discolored layer of a natural resin varnish on the surface of the painting; this varnish extended over the repaint. There was also a moderate layer of surface grime present. The frame was an artist-made, hand-carved wooden frame. The frame exhibited open miters and was supported by brackets and three vertical braces in the back. Once we had approval from our client to proceed with treatment, the board was flattened using a combination of heat, suction, humidity, and weight techniques. The board was pared down, humidified, and infused with conservation-grade adhesive. This was a long, time-consuming process that required a combined effort from almost our entire Painting Department. Our painting conservators then cleaned the surface of the piece to remove grime. The painting reverse was cleaned using a soft brush and light suction into a HEPA vacuum. After the accretions were removed, the discolored varnish layer was removed to the extent safely possible. Once flattened as best as possible, the board was adhered to an aluminum honeycomb panel with an interleaf. A coat of varnish was applied to saturate the paint layer, and the mismatched old repairs were inpainted using reversible conservation paints. To finalize the painting department's treatment, a final coat of varnish was applied to integrate the surface gloss. Meanwhile, our Framing Conservator was hard at work treating the artist-made frame. He began by surface cleaning the frame on all sides to remove particulate film and scattered accretions. Next, he stabilized and filled the open miters. The gilding was then consolidated using the appropriate conservation adhesives, and losses were ingilded to emulate the surrounding surface. Scratches and abrasions were inpainted. A buildup was created to fit the new painting depth, and the piece was reinstalled into the existing frame to conservation standards. 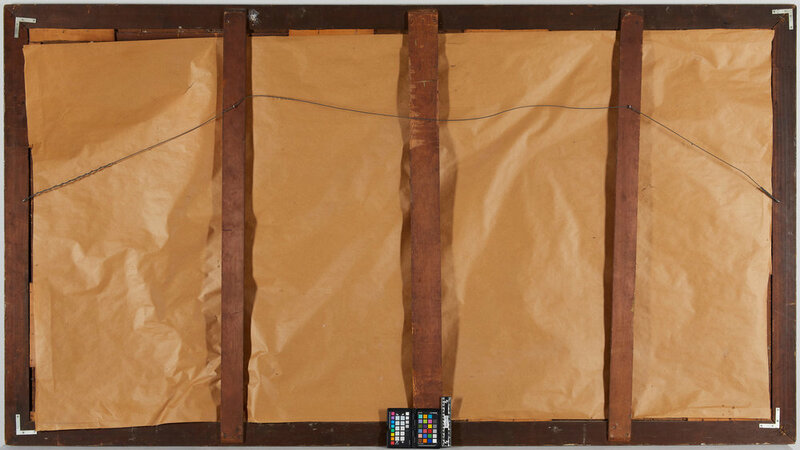 An acid-free Coroplast backing board was attached to the reverse to provide additional protection, and the hanging hardware was replaced. To finish the project, our Shipping and Transportation team installed the impressive work in our client’s home. When we called our client to make sure she was happy with the treatment results, she told us "[the restoration] exceeded my expectations. Because of the work The Conservation Center has done, I feel confident the painting will last another hundred years. In fact, probably longer." She explained she had purchased the work from her uncle and that the piece was extremely special to her. "It was one of the first paintings I ever remember being mesmerized by as a child," she told us. "The woman in the painting made such an impression on me as she exuded strength, beauty, and grace. I feel extremely blessed to have acquired this beautiful piece of art and to have had a hand in restoring it. My hope is that one day my children's children will look upon it with the same awe that I did." Her uncle, who owns a publishing company, is an avid lover of comics and illustrated books. It was through his company that he became familiar with the work of both Edgar Rice Burrows and James St. John. When he visited Chicago for a collector's convention in the late 1970s, our client’s uncle decided to visit St. John's studio to see where he had lived and worked. To his surprise, St John's widow, Ellen, still lived there. "When I visited the studio, I asked if Mrs. St. John still had any original paintings done for the Tarzan books. She told me that she didn't, but she did have the huge painting of the Bacchanale which was hanging on the wall in the studio. I asked her if it was for sale, and bought it," he explained to us. He then hired a friend with a van to transport the painting from Chicago to his home in West Plains, Missouri, where it hung on his bedroom wall for many years. He explained, "that's where my niece saw the painting when she was just a little girl, and she always loved it. I'm very happy that she now owns the painting and that she has had it restored properly and will give it a good home." The painting now lives in our client’s grand entryway, greeting visitors with its dynamic forms, palpable movement, and newly-conserved surface.